"This is one of those moments where presence is the answer." Netflix has unveiled the trailer for a short documentary (only 22 minutes) debuting later this month titled Lessons From A School Shooting: Notes From Dunblane. That's quite a provocative title, but the film is exactly as it says - about how two people corresponded regarding their experiences with school shootings. In the wake of the 2012 Sandy Hook Elementary School massacre that took the lives of 20 first graders and their teachers, local clergymen Father Bob Weiss receives a letter from a fellow priest in Dunblane, Scotland, whose community suffered an eerily similar fate in 1996. From across the Atlantic, the two priests forge a bond through the shared experience of trauma and healing. This is made by the same filmmaker who made the documentary Newtown, about the town recovering from the shooting. This looks like a sad, somber, but very moving film about communities. 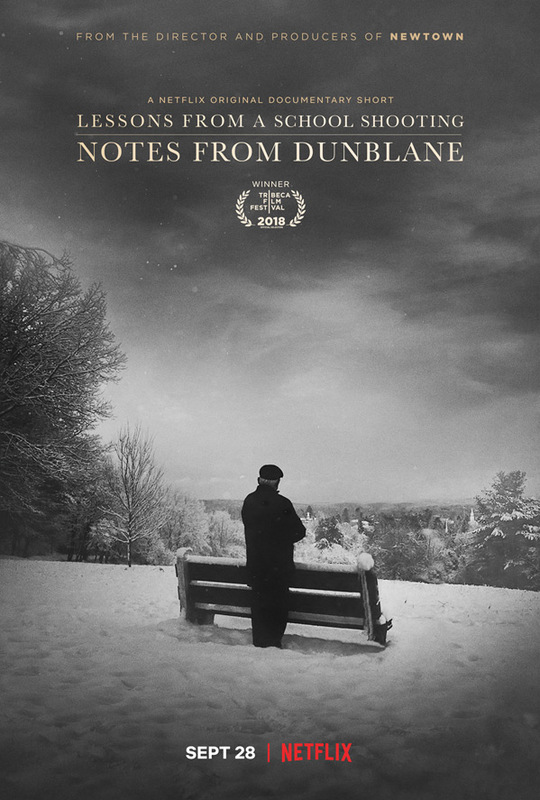 Following the critically acclaimed 'Newtown' documentary, Lessons From A School Shooting: Notes from Dunblane depicts Father Bob Weiss, who in the days following the Sandy Hook Massacre that took the lives of 20 children and 6 of their educators teachers on December 14, 2012, was tasked with the burial of 8 of those children. In the throes of profound PTSD, he receives a letter from Father Basil O'Sullivan in Dunblane, Scotland where, in 1996 16 school children were gunned down at the hands of an unhinged lone gunman. In the ensuing months, the two priests forge a bond across the Atlantic through a series of letters sharing experiences of trauma and recovery. Father Basil recalls his own town’s efforts to launch the “Snowdrop” campaign that brought about radical gun policy reform in the UK, whereas the US has had no federal reform to date. Lessons From A School Shooting is directed by filmmaker Kim A. Snyder, who also directed the documentaries I Remember Me, Welcome to Shelbyville, and Newtown previously. Netflix will release Snyder's Notes from Dunblane streaming exclusively starting on September 28th this month.